Photojournalist, documentary photographer Dominic O’Brien talks about making this remarkable photo, and about photographing Australian aboriginal communities. 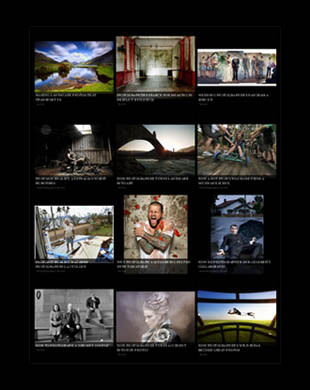 PHOTOGRILL: What inspires you to make documentary photography? PHOTOGRAPHER: I picked up a Russian Zenit camera when I was a kid and started snapping my family and friends. I’ve been compulsively doing this ever since. I’ve found that Life plays itself out in poetic vignettes. There’s a moment in these scenes, that when photographed can describe the event entirely and speak to the viewer’s memory. These powerful combinations have inspired and educated me and I try to put myself in situations where I can grab these gifts. My work as a photojournalist for major newspapers, agencies and magazines, commissioned and self-assigned has been a boon for access. I’m a bit of a lefty humanist and mass publication of my work for various worthy causes is a constant aim. I’m a lousy self-promoter and have never exhibited or entered awards. I’ve won a few when others have put them up for me. 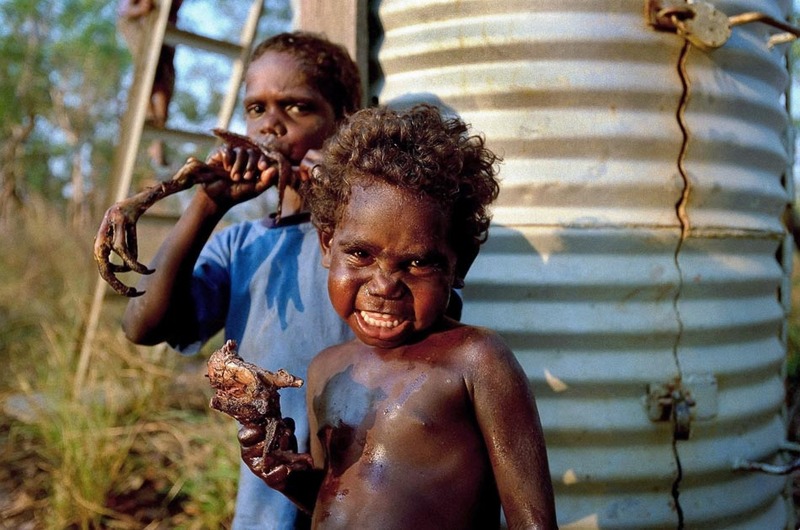 PHOTOGRILL: Why were you photographing these aboriginal kids? PHOTOGRAPHER: I’ve worked with the Mirarr Aboriginal people of Kakadu since 2000. They are the people that had uranium mining imposed on their land in the Northern Territory. I was shooting stills for David Vadiveloo’s award winning film ‘Trespass’ and we followed the mob as they hunted and enjoyed their country. PHOTOGRILL: The kids are eating some interesting food, what lead to this picture? PHOTOGRAPHER: We went fishing with the Mirarr people at Island Billabong near Jabiru They cooked a few Magpie Geese. As Vadiveloo said to me “it was an embarrassment of riches”. From a distance I spotted Claude Hardy and Jaedek Djandormerr ‘tucking into’ some goose and took a few photos of them before moving closer. The late afternoon tropical sun had everything glowing and Jaedek threw me this heart-stopping smile. Magpie goose tastes awesome, like beefy duck. I made the photo of the boys with a Nikon F5, 35mm lens, 250th f4, on 100 asa neg film. PHOTOGRILL: What’s your approach to photographing aboriginal people. PHOTOGRAPHER: As with everybody, it’s all about respect and the time you invest. The first Australians have an ancient, complex and above all respectful social system. Everything and everybody is family, and they relate to each other in close, familiar terms. My brother is married to a local aboriginal girl and I have a “skin name” which makes it easier for me to interact with people. Skin names carry social responsibility and place you in the order of things. They are also earned by continued contact. The aboriginal anthropological system is the only one that has reached universality. You don’t have to be blood to be family. So on one of my early trips I was introduced to an old woman, who I now call ‘daughter’, via our skin names. One time she said to me “Aw father I had a great time at the Cooinda pub last night, lets go down there and have a drink!.” I was thinking, “Yeah let’s go!” but the father in me said, “No daughter, you’ve got to think of your health and save your money!” She then played and winged like a little kid and I carried on like a dad. We finished up the act with dad getting his way and both of us knowing each others humor, intelligence and character in a way western white people only dream about. I tread carefully, listen a lot and give most things a try. One time I was out with family and they shot a bag of fruit bats. I avidly photographed the preparation of this delicacy and was informed I had to try some. The weird acrid, aniseed smell of the beasts had me reeling, but I told myself it couldn’t taste as bad as it smelled. I was wrong. I coughed the little piece and gave it to a passing dog. When I Looked up I caught granny’s scowling eye. Shame job. PHOTOGRILL: What’s your working style as a documentary photographer? PHOTOGRAPHER: I travel light and use small DSLRs with big sensors. I don’t like to set things up. When I do I usually get my best stuff as the set-up starts falling apart. I will light portraits when it’s needed but I try to keep it natural. I nurture a mix of intimacy and distance with the people I photograph. I need to be close enough to get the good stuff, and removed enough to see what’s coming and not interfere. This entry was posted on Wednesday, April 27th, 2011 at 9:03 am. It is filed under The Grill and tagged with People, Photojournalism. You can follow any responses to this entry through the RSS 2.0 feed.